By Melissa Lennig on December 20, 2014 1 Comment. This content contains affiliate links. As an Amazon Associate I earn from qualifying purchases. The most cherished ornaments on our Christmas tree are crafted from paper, glitter, popsicle sticks, glue, and homemade clay. They were made with love by little hands. (And occasionally, feet!) 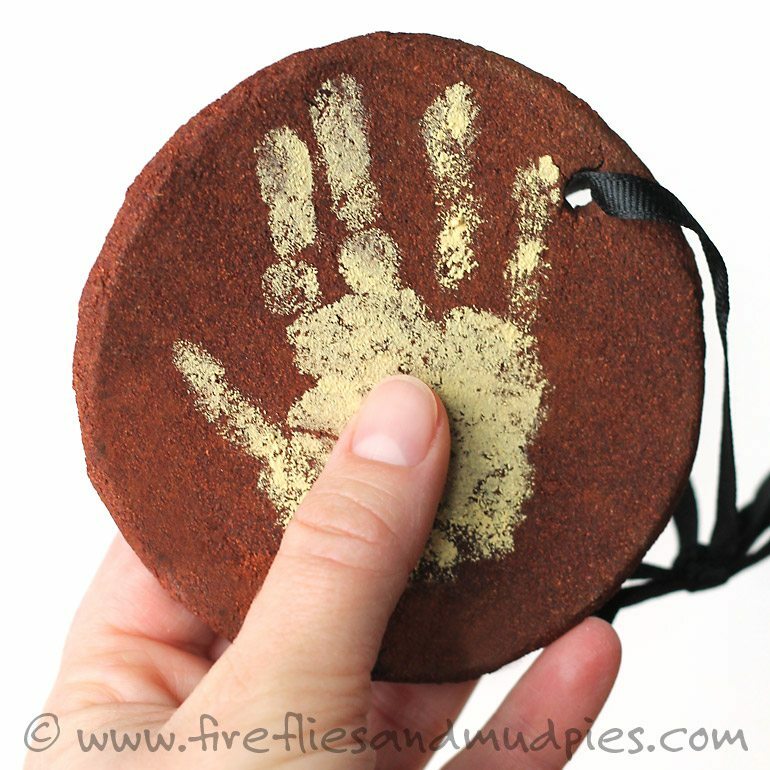 Shared below is a tutorial for a handmade Baby’s First Christmas Ornament that my oldest and I made together 7 years ago. Of course he doesn’t remember creating it, but he loves to hear the story behind it every December when he hangs it on the Christmas tree. There was no Pinterest in 2008. I used a recipe for Cinnamon-Applesauce Clay from a holiday magazine I picked up at the grocery store. The clay smelled amazing, but took days to dry. I’ve since learned to speed the drying process in a warm oven. 1. Prepare the clay by mixing the cinnamon, cloves, applesauce, and glue together. Cover the dough and allow it to rest for one hour before use. 3. Cut 2 circles out of the clay with the jar or cookie cutter. Use the straw to punch holes for hanging. 4. Place the cutouts on a baking sheet sprinkled with cinnamon. Place the baking sheet in a warm oven (180º F) with the oven door slightly cracked. Leave them to dry. 5. 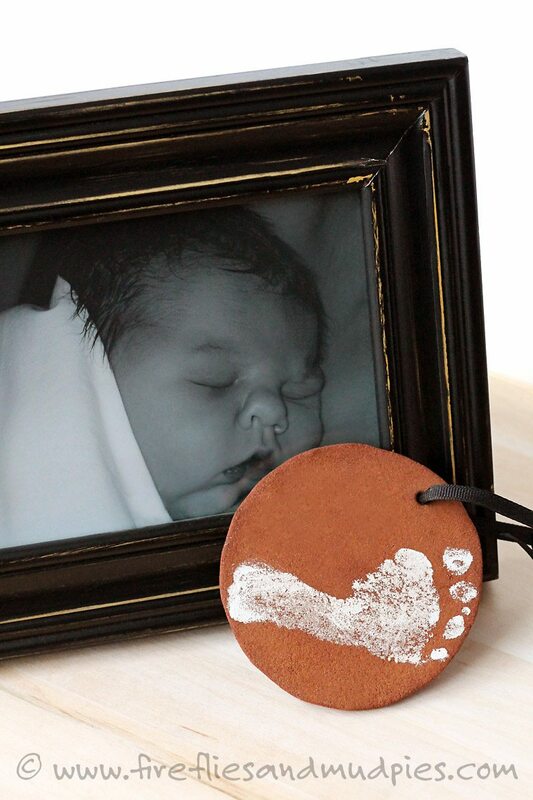 When the circles are dry, carefully spread acrylic paint over baby’s foot. Press his foot firmly (but gently) onto the ornament. Repeat this step with one of his hands. Allow the paint to dry, then string a ribbon through the hole. Look at that tiny hand! Was my boy really that small? I can hardly remember, so I’m incredibly thankful to have this Christmas keepsake! This is lovely! 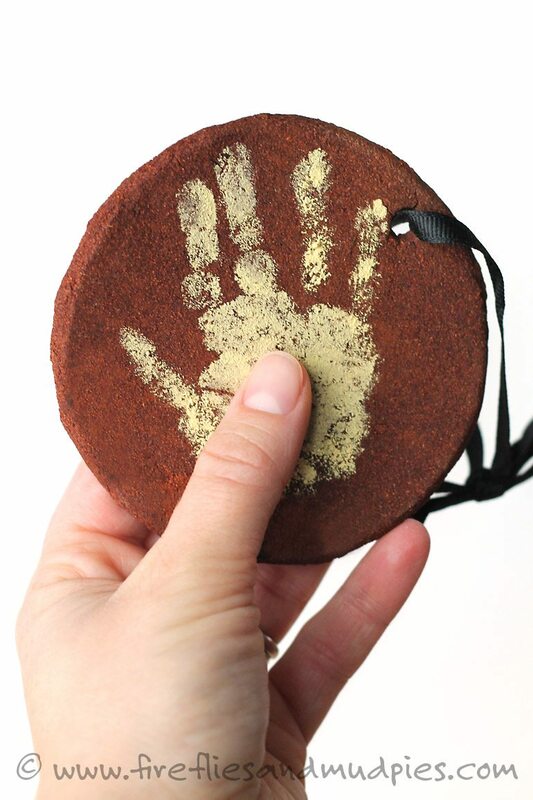 Baby handprint and footprint ornaments are my favorite.